Ari Benjamin Meyers, who is back for his second research residency at Spring while he continues to build the foundations of the Kunsthalle for Music, will present his durational performance Serious Immobilities (2013), using his own music compositions as a jumping off point. In the two days of rehearsal-workshops that precede the performance led by Ari and collaborator Sandhya Daemgen, there will be a focus on both learning set vocal material and improvising as a group, moving in space and exploring relations between performer and public in a durational performative context. The workshops favor doing over discussing and deal with durational vocal-body work, playing with set and improvised material and deconstructing the rehearsal-performance dynamic. An attempt will then be made at Spring on Saturday to create a workshop as a group installation performance. 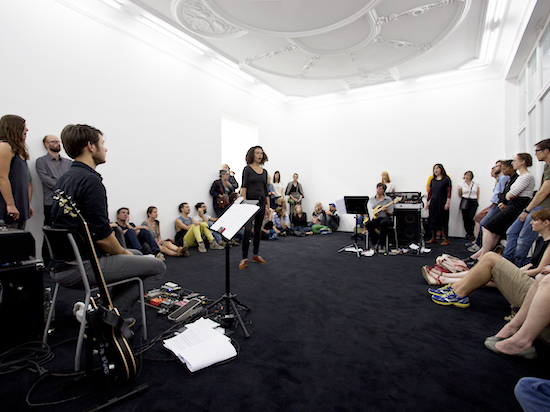 To learn more about the project co-founded by Ari, Spring and Witte de With, please visit: www.kunsthalleformusic.org.